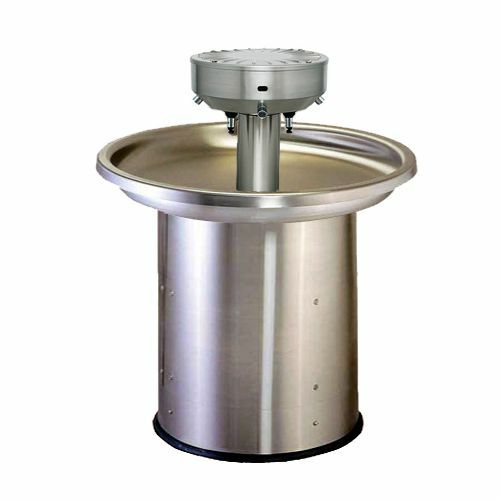 Stainless steel wash fountains are circular communal wash basins that are freestanding and can accomodate multiple users at the same time. The space saving design allows a quick simple installation whilst reducing the number of water supply and waste connections. Traditionally used in factories and garages the wash fountains are now popular in schools for communal toilet areas where hand washing is now relocated to public areas. Washware Essentials are pleased to offer most models of wash fountains from stock for very quick deliveries. In the last week we pulled out all the stops to build and deliver a school wash fountain for next day delivery when our customer was let down at the last minute. "Thank you for your quick turn around and prompt service, I will be using you again and will be in contact for my next school toilet block contract .